I have just found this article on the Gospel Oak to Barking Line on the Railfuture web site. It explains the way the line will be electrified and other issues very well. One thing it says is that the line will be electrified in two parts, so that whilst the overhead wires are erected on one part and passengers will be put on the bus, the other part can be used by four-car trains. Provided of course they lengthen the platforms. The Railfuture article is an interesting read, as it talks about this short stretch of electrification. It is joined to electrified lines at each end and several along its route, which will enable through electric passenger and more importantly freight trains to use the route. It also means that getting electric power to the line shouldn’t be too much of a problem. At present electric freight trains have to use the North London Line, but using an electrified GOBlin would avoid congested junctions at Stratford, Forest Gate and Camden Road. Replacing two-car Class 172 diesel trains with new four-car Aventra electric trains, won’t just double the passenger capacity, but because electric trains have faster acceleration, they will do better than that. The extension of the GOBlin to a new Barking Riverside station was announced in the 2014 Budget, but the Railfuture article talks about extending services the other way to Willesden Junction, Clapham Junction or even Ealing, which probably means Ealing Broadway. You can understand why Transport for London might want to do this, but it would need new platforms at Gospel Oak. 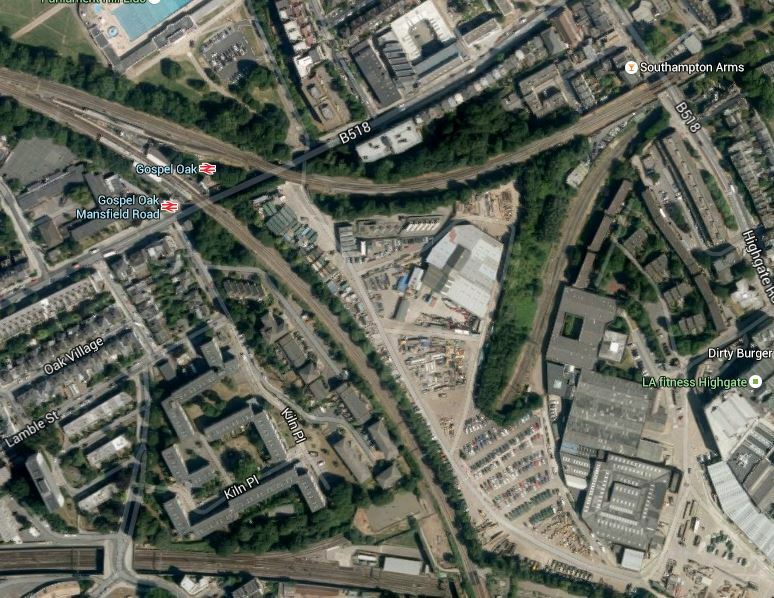 This Google Map shows the station. Note that there is a Class 172 in the platform and it looks like accommodating a train, twice that length might need a platform extension. 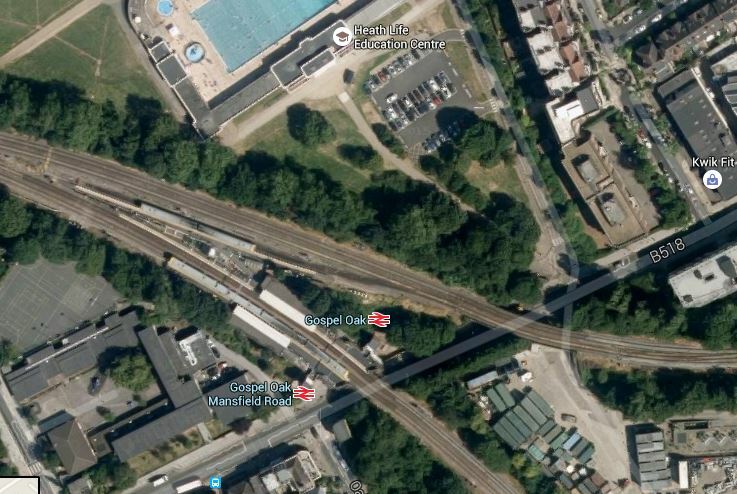 I suspect that Transport for London will look at other options, depending on where passengers go from Gospel Oak and the number of freight trains that have to be pathed through the area. On a personal view, I’d like to see trains on the GOBlin terminating in Ealing, as that would give me an easy route to the area, by getting a 141 bus from outside my house to Harringay Green Lanes. But I don’t think that is likely. After all when Crossrail opens, I can just take a 141 bus the other way to Liverpool Street/Moorgate and get Crossrail to Ealing. Railfuture reckon that up to thirty freight trains a day will leave London Gateway and many will be electric hauled and need to make their way up the West Coast Main Line. An electrified GOBlin gives them two routes across London. The second route will also enable services to be maintained, when say one line is blockaded. Limited passenger services could also be run via Stratford and South Tottenham to Gospel Oak, when work is being undertaken on the North London Line. 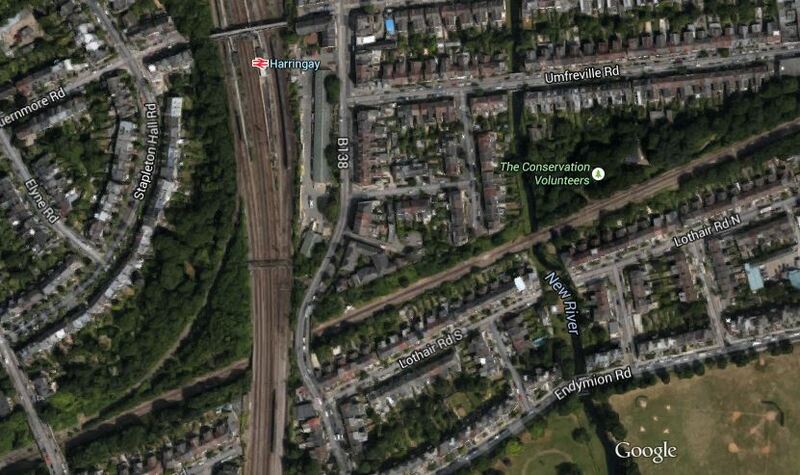 Railfuture also says that this vital junction will be electrified. The GOBlin runs across the image, with the junction under the bridge on the left. It will allow eastbound freight trains to go north on the East Coast Main Line. Another junction, that Railfuture believes will be electrified. A lot will be freight going up towards the Radlett Freight Terminal or the Midlands, but a proportion will take the Dudding Hill Line to go west. I think that it will not be long before the Dudding Hill Line is electrified to allow both electrified freight and passenger services to go west, by bypassing the North London Line. Certainly Transport for London have identified this route as a possible GOBlin extension. A few days ago, someone asked me about the overhead wires of a railway and the pantographs, that pick up the 25,000 Volts AC current. I can’t remember what their question was, but I said it is a difficult problem, as a train like a Virgin Class 390 Pendelino might be travelling at 125 mph in bad weather, so maintaining contact with a constant pressure between the pantograph and the overhead wire isn’t easy. I was reading something else and found this article on the Rail Engineer web site. Research has been going on at the City University to develop a sensor that monitors the forces at the pantograph head. As you can imagine it is a particularly harsh environment and the engineers have bean using a technology called a Fibre Bragg Grating (FBG) developed in the 1990s, based on the work by the Nobel Prize-winning scientists William Lawrence Bragg and his father; William Henry Bragg. I won’t paraphrase the article, but it is a must read. Where it will all lead to I don’t know, but I will repeat this last paragraph. In the long term, the FBG sensor system offers the ability to detect contact forces from the entire service fleet if combined with GPS and suitable telemetry. This offers the potential of continuous real-time monitoring of the entire overhead line network. Then the Braggs’ work on X-ray diffraction of crystals a hundred years ago could well have made overhead line dewirements also a thing of the past. Just imagine what it would mean to the operators of our increasingly electrified rail network, if delays caused by trains bringing down the overhead wires were to be reduced. I’ve met people at Cambridge University for whom William Lawrence Bragg was their tutor and they have described him as a quiet man, who was superb in getting brilliant work out of the students, he tutored. This tale illustrates why we must do more and more research and often that the solution to a difficult problem is unexpected, but brilliant.